Illinois and SNG Announce Partnership | Strategic Networks Group, Inc. 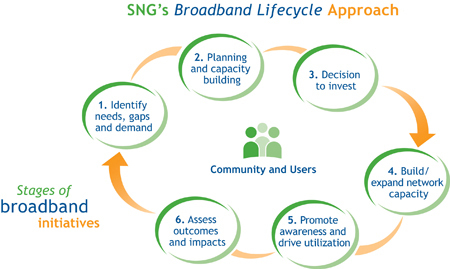 The PCI initiative includes a state broadband strategy following SNG’s broadband lifecycle, informed by statewide research to measure broadband’s utilization and identify gaps. The result will be a statewide broadband plan preparing Illinois to be a leader in job creation and economic growth, education, medical innovation and quality of life. Another output of the research will be reports to individual organizations to help them understand how they can become more competitive through broadband.